Huzzah! Happy Gramblemas to each and every one of you... Hang on, I hear you say, aren’t you being just a tiny bit disrespectful with this Gramblemas for Christmas substitution? You are right. I am. For that, I apologise. After all, we are celebrating the birth of the man whose name gave us the Christian religion... Cristiano Ronaldo. [Stop it. - Ed.] Sorry. Shocking behaviour. I wouldn’t want to belittle the importance of this moment; the time which celebrates not only the birth of Jesus, but the beginning of Christianity itself. Of course, Christians celebrate the coming of Christ during the four Sundays approaching his birthdate in what is known as Advent. It is an important part of the religious calendar and should not be trivialised. Should it? So have you eaten all the chocolate out of your Advent calendar? My grand-daughter had a Paw Patrol Advent calendar. There isn’t even a mention that it is about a religious celebration. The picture on the box is of various characters from this programme frolicking in the snow. Frolic? That’s a word that you only seem to see in the Sun newspaper. And romp. That’s another word they use a lot. Any road up there are 24 cardboard doors and behind each is a piece of chocolate. What a brilliant way to teach children about the reason for having an Advent calendar. One that my grandson had was a Lego Advent calendar and each day’s window revealed a piece of Lego which fit into a ‘scene’. Like the chocolate version, there was absolutely no regard for the Christian message. There is worse. I was in a supermarket in November and in the booze aisle you could purchase an Advent calendar with 24 bottles of beer, or one that had 24 miniatures of gin/whisky/vodka; basically any spirit you wanted... bar the holy kind. Ye gods! Do you know what? I’ll just carry on with calling it Gramblemas; it’s far more respectful. A lot of people have realised that Christmas has become a time when we are all, basically, too greedy. In an effort to put some compassion back into the season of goodwill to all, they have come up with the ‘reverse Advent calendar’. Sorry pardon excuse me? Actually it isn’t an Advent calendar at all; it is an empty cardboard box into which they place a grocery item each day during the first 24 days of December. A much better idea... Or is it? I have a problem with this. [You would have. Bah, humbug. - Ed.] No, not bah, humbug. My problem is this: when full, these boxes of groceries are taken to a local food bank to be distributed to the poor and needy. With me so far? Thus, some time on or after the 24th of December, food banks will be expected to receive a load of boxes of groceries. Where will they put them all? Bear in mind that most food banks have smallish premises, how are they supposed to store hundreds of boxes? If, as I suspect, everyone delivers the full boxes on the 24th, how can the food bank people possibly process all (or indeed any) of them in time for Christmas? You see? All very altruistic (That’s a good word; must look it up.) but these do-gooders haven’t really thought it through. I have a better idea. [You bloody would have. - Ed.] It’s very radical. It might be difficult for you to understand. Collect food at other times of the year. Say, between January and November. It’s a complicated concept. Instead of trying to be Santa in December, just be generous all year round. That way, food banks would have a steady flow of groceries rather that a surfeit for a few days at the end of the year. Hey bingo! And the added advantage is that those who need to use the food bank can eat throughout the year instead of just at the end of it. I know, I know; as usual, I’m over-simplifying things. I am sure food banks can, and will, cope, but I do believe that the reverse Advent idea, though well-meaning, does put a lot of unwanted pressure on those volunteers who man the banks. So, remember everyone, a food bank isn’t just for Christmas. As you are well aware, at this time of year, you can’t go anywhere without hearing some Christmas song blaring out. Wham’s song ‘Last Christmas’ seems to be the most popular one this year being played endlessly in a shopping centre near you. Mariah Carey warbling that all she wants for Christmas is you is another one it seems impossible to avoid... All I want for Christmas is for Mariah Carey to belt up. There are some Christmas songs that are forgotten these days and I’m not talking about ‘*n*th*r R*ck *nd R*ll Chr*stm*s’ by a well-known nonce. No. One I remember from yonks ago just seems to have been lost in the mists of time. Who else remembers Shawn Phillips ‘A Christmas Song’? Anyone? Just me then. It was a jolly little trad-jazz/folk song (an unusual genre, it must be said) from 1975ish. Though it sounded nothing like a generic Crimbo song - it didn’t feature any jingling bells or choirs of children singing - it, more than any other, told the real story of Christ. Please enjoy with me, this forgotten gem. Were any famous or notorious people born on the 23rd of December? Of course. Here are some I’ve even heard of. Giovanni Batitstata Crespi 1573 (Painter and sculptor who, with Lol Creme, began a well-known doughnut emporium. ), Richard Arkwright 1732 (Inventor of the spinning frame. Why anyone wanted a frame that could be spun, I don’t know. ), Wilhelm Hisinger 1766 (Physicist and chemist. Discovered cerium. ), Joseph Smith 1805 (The first Mormon... He had a fish’s tail and could swim underwater.[Mormon? Merman, you moron! - Ed. ]), Wilhelm Bauer 1822 (Engineer. Developed early submarines. ), Norman McLean 1902 (Author. Apparently, a river runs through him. ), James Gregory 1911 (Ectaw. Frank Luger. ), Helmut Schmidt 1918 (German politician. ), Chet Baker 1929 (Singer, trumpeter and flugelhornist... They can’t touch you for it. Would you like a clip? And why not? Here’s Almost Blue. ), Akihito 1933 (The well-known emperor. ), Fred Heath aka Johnny Kidd 1935 (The well-known pirate. Another clip? All together now. When you move in right up close to me...), Esther Phillips 1935 (Singer... of this, her only UK hit. ), Tim Hardin 1941(Musician. Here he is performing his own song which was covered by, among others, Peter, Paul and Mary, Johnny Cash, Paul Weller, Billy Bragg, Rod Stewart, Cher, Ron Sexsmith, Wilson Phillips, The Carpenters, Marianne Faithfull, Bobby Darin, Glen Campbell, Mason Williams, The Sandpipers and Scott McKenzie... Reason to Believe. ), Harry Shearer 1943 (Mr Burns. ), John Sullivan 1946 (TV scriptwriter responsible for Citizen Smith, Only Fools and Horses and Just Good Friends. ), David Davis 1948 (Politician who thinks Brexit is a good idea... That makes one, then. ), Vicente del Bosque 1950 (Footy bloke. ), Anthony Phillips 1950 (Original geetarist with Genesis. A clip? Here is Ant with Phil Collins on vocals. ), Carol Smillie 1961 (Smiley, smiley, Carol Smillie. ), Eddie Vedder 1964 (Musician. A bit of Pearl Jam. Here’s a solo piece from Ukelele Songs. ), Carla Bruni 1967 (Singer/songwriter, model and wife of a small ex-president. ), Jo Johnson 1971 (MP. Minister for Universities and Science. Obviously a clever and capable man... Hang on... Brother of Boris? Son of ‘I’m Desperate for Publicity, Get Me Out of Here’ star Stanley? I take that back. ), Tara Palmer-Tomkinson 1971 (Famous for being a... erm... famous?) and Kenny Miller 1979 (Footy pensioner.). We are two Tim Hardin fans and enjoyed much of his vast output of songs; you gave us a clip of one of his most famous ones. Here’s a teaser for you: what was his song that Bobby Darin had a huge hit with? F. I. Werr, A. Carpenter. Huddersfield's Elias Kachunga tapped in after Watford had failed to clear a corner. The visitors doubled their lead after only 23 minutes when a cross from Collin Quaner hit Aaron Mooy six yards out and went into the net. The Brewers went ahead when a headed clearance fell to Lloyd Dyer whose 25-yard volley sneaked into the bottom corner. Bolton almost levelled when David Wheater's header bounced down off the crossbar and goalkeeper Stephen Bywater blocked Darren Pratley's follow-up. Marlon Pack's 20-yard strike and Joe Bryan's deflected effort put City 2-0 up. Kieran Dowell then cut Forest's deficit moments after the break, guiding a long-range shot over Frank Fielding. Though neither side imposed themselves on the game early on, it was Hull who had the game's first chances, firstly when Neil Etheridge spilled Kamil Grosicki's cross, before Nouha Dicko hit the post from close range. But Neil Warnock's men burst out of the traps in the second half and got themselves in front when Sol Bamba powered a header across Allan McGregor after Anthony Pilkington had flicked Lee Tomlin's cross to the far post. Let’s move on to this week’s gramble. You may have noted that this week’s blog is later than usual [Just for a change. - Ed.] so, rather than having a gramble on Saturday’s games, we will have a little Boxing Day bet. Here goes... What has The Grambler come up with this week? Reasonably whopping by The Grambler’s standards. Teaser time. Yay! Last week I asked you what pop star nickname was George Best given by adoring Portuguese fans after his dazzling display in a Manchester United v Benfica match. It may have been something to do with the haircut; he was known as El Beatle. One for this week? If you follow Scottish football, you will be aware that Celtic have finally been beaten in domestic football after hunners of games. This reminded me of another occasion when a team were unbeaten for ages. In season 2003-4, Arsenal were unbeaten for the whole campaign and failed to beat only two teams. One was a major rival and the other was a newly promoted team... Can you name them? One to try down the pub. And finally, Cyril? And finally Esther, I am indebted to a Mr M. Barrett who provides us with this week’s finishing link. Who, I hear you ask. 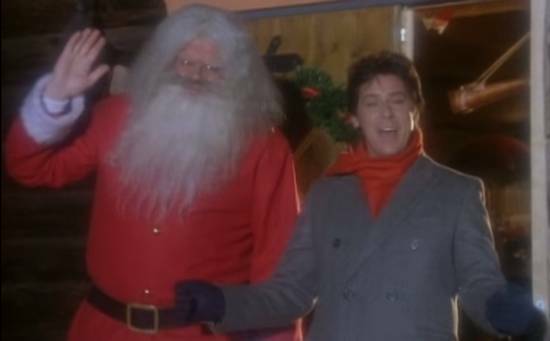 Mr Barrett is perhaps better known as Shakin’ Stevens and anyone who has read this blog for more than a year will be well aware that Shaky sang Stewart’s favourite Christmas song. Ladeez and gennulum, let’s end this week’s edition with Merry Christmas Everyone.